Tucked in the northern portion of the Methow Valley in Washington State’s Okanogan County, Winthrop provides a year-round vacation destination for both outdoor enthusiasts and for those who prefer the music festivals and the arts. During winter months, this old-west theme town is home to over 120 miles of groomed cross-country trails. The largest locale for Nordic skiing, not just in Washington State, but in the entire US! Don’t want to cross-country ski? Winthrop offers plenty of other winter sports, like snowmobiling, which is some of the best in the state. There’s also downhill skiing, heli-skiing, back-country skiing, fat biking and an outdoor ice skating rink. When the weather warms up, the outdoor fun doesn’t stop. Winthrop. Year-round sunshine make Winthrop a great base from which to explore the Methow Valley. Hiking, mountain biking, horseback riding, climbing or river floats. Whichever way you choose to get around, there’s an option to keep every member of the family happy. Golfing enthusiasts will enjoy playing the 18-hole certified Audobon course and kids will love the putt-putt course in downtown Winthrop. Need more activities? Try ballooning, fishing, bird watching (over 250 species in the Methow Valley! ), stroll through the farmer’s market or just taking a scenic drive through the North Cascades. Besides the breathtaking outdoors here, Winthrop offers plenty of other things to do. If you’re into live music festivals, the area offers everything from a chamber music festival to a rhythm and blues fest. Prefer the arts? Meander through the town’s many art galleries (including an incredible glassworks!) or catch a play or musical in nearby Twisp at the Merc Playhouse. And when it comes to watering holes, whether you’re ready to unwind, or get caffeinated, Winthrop offers plenty. Old west saloons. Coffee houses, a cider house. brewery or winery, whichever libation you prefer, you can find it here. Ready to eat? Winthrop and the Methow Valley offer everything from gourmet, five star dining to pubs and bakeries. Winthrop and the Methow Valley provide the perfect location to get away from it all, soak up the sunshine and enjoy a more active, or mellow, lifestyle. 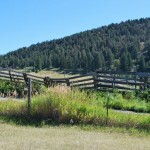 If you’re interested in making Winthrop or the Methow Valley your home, either throughout the year or just seasonally, you’ll discover plenty of real estate options , from cabins, condos, family homes to vacation properties or farm land. And even commercial property. At Baines Title and Escrow, we’re fortunate that we’re based in the Okanogan. We get to enjoy this area year-round. In fact, we’ve offered our real estate title and escrow services in Okanogan county for over 100 years. If you’re interested in buying real estate in Winthrop please consider Baines for your title and escrow services. We also provide account servicing for payment processing on private party real estate transactions. Please contact us with any questions you may have or if you need more information. We look forward to helping you with any of your Winthrop or other Methow Valley real estate title or escrow needs, whether it’s for residential, recreational or commercial property transactions. You can rely on Baines to close the deal. Interested in learning more about other Okanogan destinations? 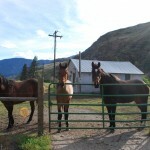 Please visit our Discover the Okanogan page!